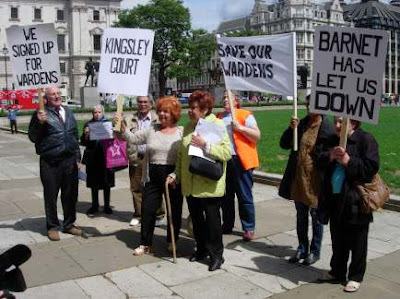 Not The Barnet Times: Save Our Wardens! I have written many times about Barnet Council’s shameful plans to scrap the warden service, but tonight I have seen for myself the fear in residents’ eyes. So much so, that I am abandoning my usual style of writing in the third person. This is no time for grammatical niceties. I was attending prayers in memory of a family friend who sadly passed away. The service took place in one of the sheltered houses where he had happily lived for several years. I recognised one of the other residents from recent news footage on the BBC and so went over and talked to her. She told me to look around. There were residents who were blind and some in wheelchairs. “How are they supposed to get out if the warden has left for the day and there is a fire?”, she asked. Good question, but I had no answer for it. “There is going to be a fatality”, she warned. Another resident said: “Of course the woman in charge of this got her own mother out in time”. Lynne Hillan denies that she acted improperly but even if she genuinely didn’t have any say in the decision to move her mother to a home not affected by the cuts, the simple truth is that residents don’t believe her. One lady complained to me: “They lost all our money in Iceland and the man in charge is a banker”. At least, I think that’s what she said. I spoke with the relative of one resident who was also visiting. He said: “The council are going to do whatever they want to do. They are not interested in consultations. They have already made their mind up”. He is right that the council is not interested in public consultations. They simply don’t care that 85% of residents oppose their plans. But I do not accept for one moment that this is a done deal. The public can and must put an end to this madness. In 2002, the Labour/LibDem Administration, led by Alan Williams, proposed granting permission to Barnet Football Club to let them build a second stadium on green belt land. Local residents were enraged. So enraged that an all party pressure group was formed called BRASS - Barnet Residents Against Second Stadium. The council simply ignored the public protests and local residents imposed the only sanction they could - they voted Conservative. Life long Labour Party members switched allegiance and consequently Labour lost two seats to the Tories in Underhill ward. That was enough to swing control of the council to the Conservatives and save the green belt. To those head-in-the-sand politicians who say that local elections cannot be won on single issues, think again. To Lynne Hillan, who started this whole process: explain to voters how you can sleep soundly at night knowing that elderly residents are living in constant fear. To Richard Cornelius, who is too scared to go and visit the affected residents: do you really think David Cameron will send you to the House of Lords when you treat elderly residents so callously? And to £103,000 a year Brian Coleman, who said of the warden cuts: “The sensible nature of Barnet's changes is becoming more evident every day”, I say go. Just pack up your gold chains and get out of this borough. We are all sick and tired of your big mouth. You are arrogant, pompous and hopelessly out of touch with reality. You are an embarrassment to real Conservatives. To the rest of the Tories on Barnet Council, think hard about this: do not underestimate the strength of public anger over this issue. If the council can change control due to the actions of residents in just one ward, think what will happen when residents across the whole borough go to the ballot box in May. Conservative voters in every part of Barnet are just as opposed to warden cuts as Labour and LibDem voters. And just as Labour voters switched allegiance on a point of principle in 2002, so Conservative voters might switch as well - unless you come to your senses and abandon these ill conceived proposals. You have no mandate to impose such savage cuts on the frail and vulnerable. The same financial savings Lynne Hillan claims are needed can easily be made by cutting out bureaucracy in the press and PR department alone. Just ask yourselves one question. Are you really prepared to risk losing power for the sake of Lynne Hillan’s cruel and unnecessary plans? excellent column, i agree entirely, that the scrapping of the wardens system is completely unnecessary, pointless, and leaving resisents in fear. i had a similar experience in essex, where they (to quote) "want to promote independent living." independent living is fine, if you can do it, but if you cannot do it, as with residents living with the care of a warden, then this becomes null and void surely?? or willl they just PUSH ANOTHER UNNECCESARY SERVICE onto the people of this borough, with no thought, apart from the thought of saving a few quid to line their personal pockets. there are numerous ways the council can save money, like for example, not awarding councillors payrises AND increases in expenses, in the current climate that are out of context with the financial situation we are supposedly in. back to wardens: isn't it true that when these residents signed up to living in these protected and secure homes, that they only moved to certain homes as they were guarenteed a warden on site to look after their welbeing? the majority of them have had to sell their own homes to move into theses schemes. so then, isn't his a breach of contract on the part of the council?? not only does it give the added safety for the people living within these homes, but also to the families of the residents. all parties will be left shocked, disturbed and completely disgruntled at the decision (if it is made) and will almost certainly vote against the tories in may. I think that the ’breach of contract’ argument is being pursued by the Solicitor acting for residents. The fact that the council ignored a public consultation is not likely to impress the Judge - especially as there was no mention of this plan in the last Conservative manifesto, so they have no mandate. The council says it has to save money. I wrote previously how savings could be achieved without affecting front line services. David, whilst I agree about the warden cuts posing a real threat to the well-being of the care home residents (I also had the misfortune of being doorstepped by Cllr Cornelius the other week - "So you're the one who's cutting the wardens!" I cried), I have to take issue with your description of BRASS as an all-party presure group. I take it you mean "all-party" in the same way that the Taxpayers' Alliance are all-party? BRASS was most definitely all-party - well Labour and Conservative at any rate. Two of the main organisers were Labour party members. This was not a Tory led group. It worked well because everyone focussed on the issue of the green belt rather than partisan party politics.